Ok now I have given y’all the crockpot red beans recipe that I grew up making. Here is the link in case you need it. Please let me say right now, I am in no way discounting this recipe by posting a new one. No siree Bob! This is my tried and true way to cook red beans. But I am not so stuck in my ways that I cannot say I love this new recipe as well. Some of the best red beans and rice I have ever had were in NOLA so this recipe is approve painterly named. I am loyal to a fault, but I also accept new things when they are FABULOUS. This recipe is just that…fabulous. Knock your socks off, slap your mama delicious. 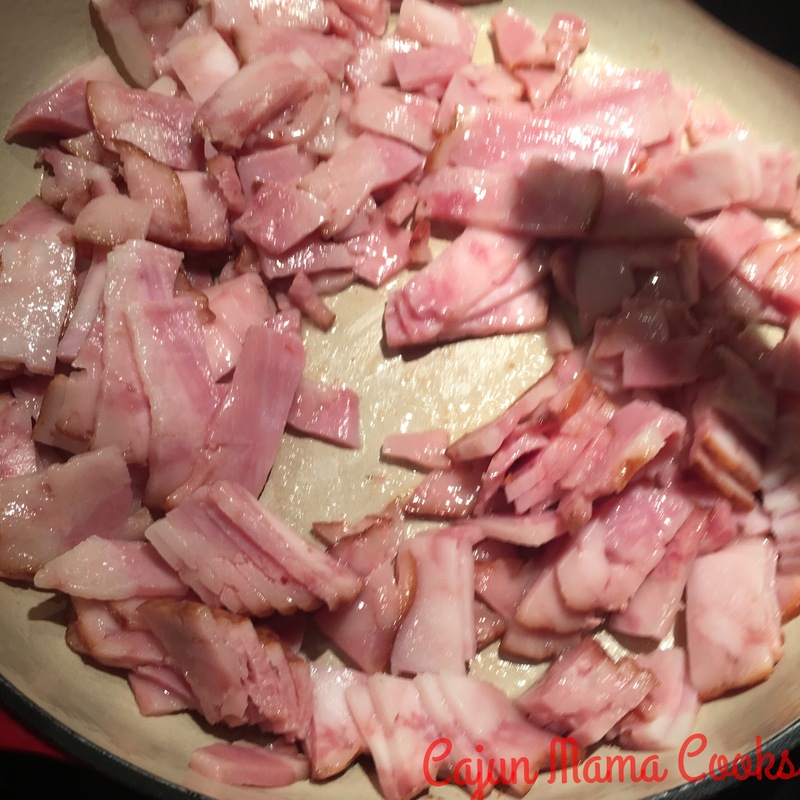 I found this recipe on the Camellia website and if you are familiar with my blog at all, you know I only use Camellia beans. Here’s a link to their recipe. 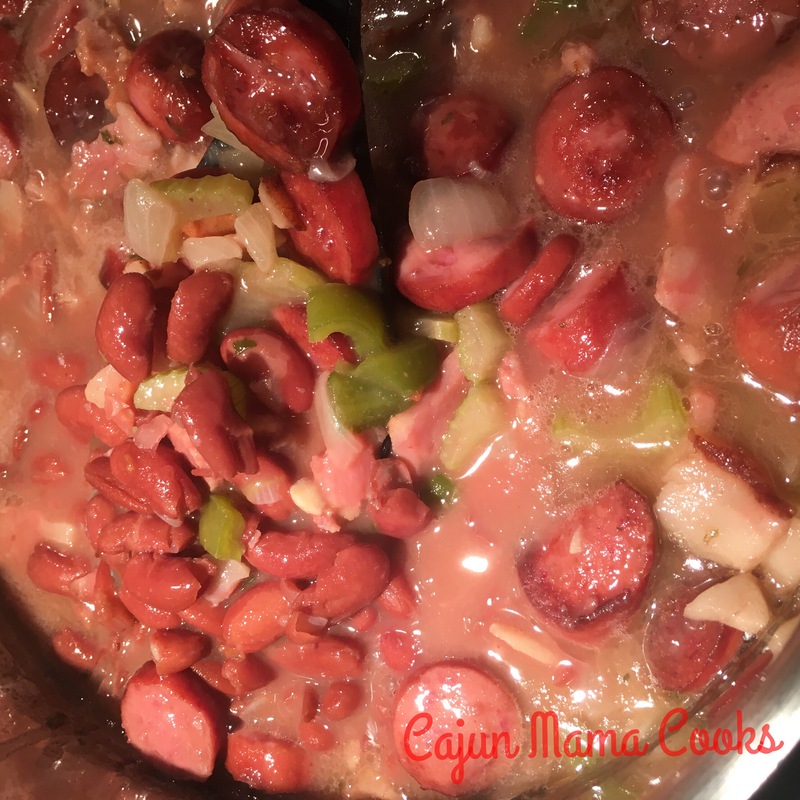 I got the envie to make a new red beans recipe while big daddy was out of town a few weeks ago and as much as I hated to make them without him, sometimes the show just has to go on. But I did save him some and he was blown away. I made them again the other day and again this recipe was met with rave reviews. They are that good. Now the bad thing is that I don’t have a crockpot version of these yet but they are really not all that high maintainence. The best news is that they are even better the next day, so you can totally make them on a Sunday and then eat them on a Monday…which is only right. Mondays and red beans go together like…well…red beans and rice. So do yourself a favor and make these as soon as possible. And then let me know what you think. Oh and you’re welcome in advance. Add your soaked beans to a large stew pot and then pour the chicken broth over the beans. You should have a ratio of one part beans to two parts liquid. You add water to make up the difference. I just added more chicken broth. Bring the beans to a rolling boil over medium high heat and then reduce heat to a low simmer. Let the beans simmer on low for an hour or two, until beans are tender. I just let them simmer for 2 hours on very low heat and gave them a stir from time to time. Beans tend to stick at times. 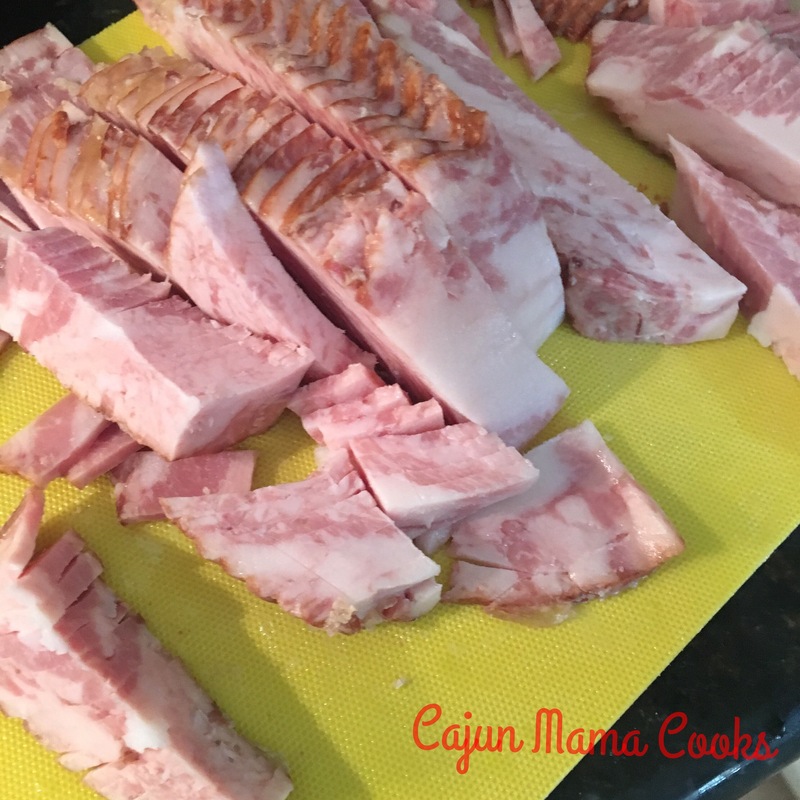 Now while the beans are simmering on low heat…you are going to add your cut up salted pork meat of choice to a warmed skillet. You are going to cook this meat on medium low hear until it is nice and browned and you have rendered all the lovely fat from it. Oh yes I said that. It’s a beautiful thing when you can say the words render the fat because that means something is about to taste extra wonderful. Once the meat (I used salted pork bacon and it was just so wonderful), and perfect. And yes I do know I am discussing salted pork bacon. You’ll see. Now set that browned meat aside. I sautéed my sliced sausage at this point so do that if you are using sausage. My kids have to have their sausage in their red beans. Then set it aside as well. Now you will add your chopped onion, celery and bell peppers to this skillet of rendered fat. Now sauté them until tender. Add your parsley and garlic towards the end and get them in the mix. Now you will add the sautéed veggies and the browned salted pork and sausage to your beans that have been simmering. Also toss in the bay leaves and sugar (if you trust me…you will add it. It is the icing on this cake). Add the dried thyme I used dried oregano because that is what I had. Ah improvisation is a beautiful thing!! Please add your salt sparingly. I added maybe a teaspoon and that was for a double batch. The salt pork and sausage adds so much salty flavor. Now continue to let those beans simmer to let all of those flavors combine. You can let them simmer for another 1-3 hours. Just make sure you stir them from time to time. Now Momou always told me to smash a few beans up against the side of your pot with your spoon to make them a little creamy. I do this a few times and the beans have the perfect consistency. Momou is wise yeah Cher!! Serve over rice alongside some cornbread and you will know my truth!!! So much yum in one pot of beans! !